I his species inhabits woodland and waterside foliage, traveling nomadically in search of nectar, insects, and flowers. Flocks of noisy, aggressive birds are seen feeding in blossoming trees. • NliST A cup nest made of grass and bark, bound with spiderwebs, and suspended in the outer foliage of a tree or bush. •DlSTRIBl ITION N. Australia. 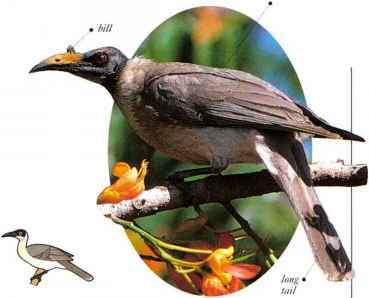 I'his large, gray-brown honeyeater is recognized at closc quarters by an upright growth on the top of its bulky bill, and by its almost totally naked, black head. 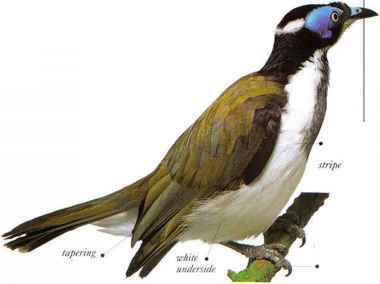 Most of the time it remains high in the canopy, where it has to be identified by its vociferous calls and aggressive behavior. Its diet consists of berries and larger fruits, insects, nectar, and the eggs of other birds. • NEST A large, cup-shaped nest made of grass and bark, bound together with spidervvebs, and usually built high in the outer branches of a tree. I he large size of this bird, and its unusual appearance, with patches of bare, blue skin around the eyes, make this species very conspicuous. It is seen in scattered woodland and scrub, where it forages on tree trunks and branches for insects, as well as catching them in the air. Nectar and fruits, including cultivated bananas, also form part of its diet. • NliST A bulky cup nest made of coarse plant materials, lined with softer materials, and placed in a tree fork. This species sometimes uses old nests of babblers or miners. 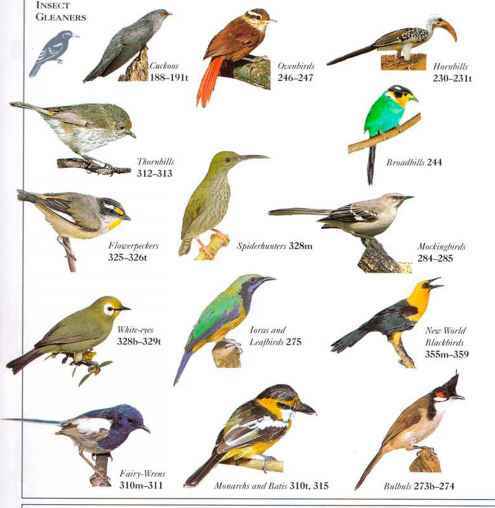 I honeveaters, this species can be aggressive toward birds and even people.